Bound for Bay Ridge Yard in Brooklyn, a westbound freight out of Cedar Hill Yard hums through the New Haven station behind a pair of EF-4 electrics, with the NH's headquarters building in the background. The empty refrigerator cars on the head end are returning west for another load of produce or meat. Photographed by Tom Nelligan, August, 1968. Great pair of EF-4 photos! 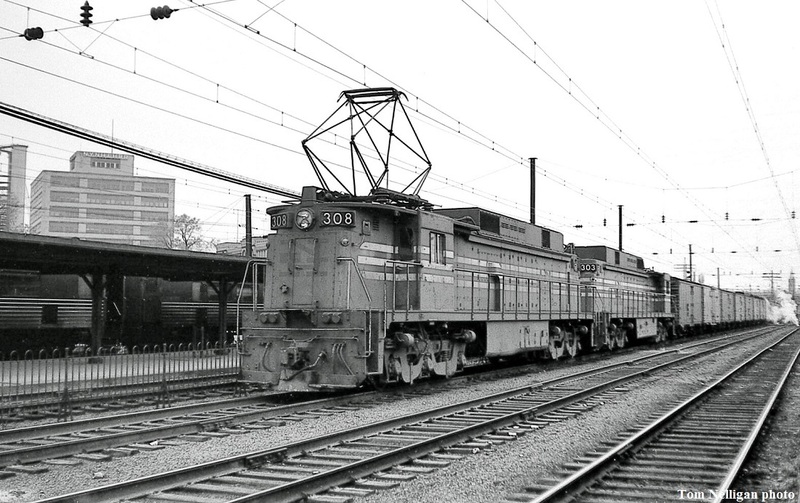 Wonder if these motors wore more paint schemes than any other electric locomotives: VGN, NW, NH, PC, and Conrail? It's interesting that only one of the two motors' pantographs are used - I guess because there's a power cable connecting the two motors. Three and a half years ago, Conrail blue and rust E33 4601 was handed off from P&W to PAS at Gardner on its way from RR Museum of New England to the Illinois Railway Museum.